Welcome to “Sally’s Senate Snapshot,” my regular correspondence to keep Senate District 40 constituents up-to-date on what’s happening at the Gold Dome. Week 1 was one of ceremony and start-up. We elected Senate leaders like the President Pro-Tem who will fill in for the Lt. Governor when he cannot preside over the Senate, all of the newly elected and re-elected Senators were sworn-in, and we attended the Governor’s State of the State address. We also spent time getting my office up and running. When you call my Senate number (404) 463-2260, you’ll speak to my new administrative assistant, Anna Boggs, who also works for Sen. Tonya Anderson. Anna is a veteran Senate staffer, so she will be as helpful to you as she already has been to me. I was honored to be sworn-in to serve the people of Senate District 40 with my husband Jay and sister Anne at my side. It was a momentous moment of shared expectations and hope. The Senate voted on new rules that govern how we operate. Unfortunately, we were given virtually no time to review the rules before the vote, and my colleagues and I had serious concerns about a rule change that puts a 2-year time limit on filing sexual harassment claims against Senators, and a ban against filing complaints once a Senator becomes a candidate. We also had questions about a new rule that limits free speech in and around the Senate chamber. The Democratic Caucus and one Republican Senator asked for more time to review and discuss the rules, but we lost the vote to the majority who approved the new rules. We received our committee assignments. I will serve on the Higher Ed, Ethics, and Natural Resources committees. With two kids about to enter college, I feel the pain of college affordability along with many of you and I hope to find some solutions through the Higher Ed committee. The Ethics committee will consider bills related to a new voting system for Georgia, one of my top priorities. The Natural Resources Committee will allow me to learn more about our environment and how our natural resources impact Georgia’s economy. Leadership opportunities did not get doled out equally. Women and people of color are underrepresented on committees that consider the most bills and overrepresented on those that only consider a small number of bills. Republican leaders even reduced the powerful Judiciary Committee that considers bills related to our legal system by two seats to prevent two new highly-experienced and decorated female lawyers from participating. I was proud to watch my female colleagues from both sides of the aisle make very strong statements objecting to Republican leaders overlooking their talent and expertise. 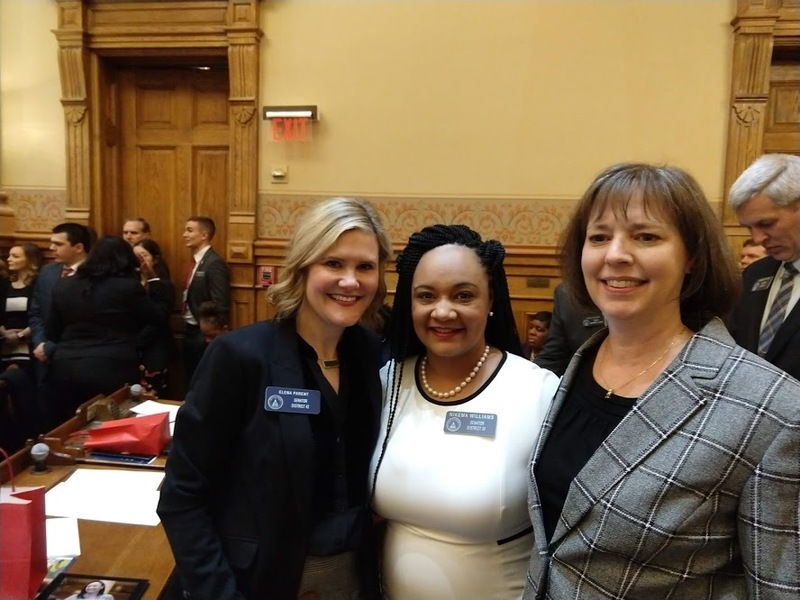 Speaking of women, I was elected to co-chair the Women’s Caucus, the only bipartisan, cross-chamber caucus in the General Assembly. There are more women serving in the Georgia General Assembly than ever before thanks to women who volunteered and voted in record numbers. We now have a big responsibility to come together to focus on and address the needs of women. We plan to kick off the caucus later this month. We began drafting my first piece of legislation in the Senate — to repeal the wildly unpopular Campus Carry bill that Governor Deal signed in 2017. Gun safety is one of my top priorities and I continue to hear from teachers and students that they feel less safe with this law in effect. The Capitol is a gun-free environment. Our students and teachers deserve the same sense of security as our lawmakers. I signed on to several bills including SR 18 requiring the Secretary of State to be replaced if he/she qualifies to run for another political office, to prevent the very unethical practice of a Secretary of State overseeing his/her own election. I also signed SB 27 to allow TSA workers to draw unemployment benefits during the federal government shutdown to keep our airports running smoothly and safely during this very difficult and disruptive time for our federal workers and our country. We are not in session next week so that we can attend hearings for Governor Kemp’s proposed budget — I’ll update you on that next week. The Governor did highlight certain budget priorities in his State of the State address which I support, such as raises for teachers and state employees, school safety grants, and extra funds for high school mental health counselors. His commitment to Medicaid expansion, however, was lacking details, so I will be paying close attention to the Senate Health Sub-Committee of Appropriations next week. Our official legislative session will begin again on Monday, January 28th. The best way I can represent you is to hear from you. Please feel free to contact or come by my office any time. My Senate web page is still under construction, but you can find my email address and office location there. My Senate office phone number is (404) 463-2260.